"Retiring, like truth, into the secrecy of her profound retreats Masonry presents her symbols to her initiates and demands of them that they shall study and understand them in order that they may value them, as men always value that only which is attained with difficulty and by exertion." Perhaps it is because her symbols seem so mysterious and indued with mysticism that we need to understand them. Or, perhaps it is the very effort we expend in understanding them that makes them so valuable. Whatever the reasons and by whatever means you come by an understanding of Freemason symbols they are keys to deeper and more meaningful knowledge. I congratulate you on your curiosity and welcome you to come along and explore some of the many Freemason symbols. Naturally, any discussion of Freemason symbols must begin with the universally accepted symbol of Freemasonry, the Square and Compasses. From the very beginning, the degree of Entered Apprentice, we are told that the Square teaches us to square our actions with all mankind and the Compasses teach us to circumscribe our desires and keep our passions in due bounds. Basically, the square symbolizes the golden rule, "Do unto others as you would have others do unto you," and the compasses symbolize Aristotle's advice, moderation in all things. The Square and Compasses is most often seen with the letter "G" in the middle. The letter "G" symbolizes geometry because by the science of geometry we may be better enabled to unravel the mysteries and wonders of nature. The letter "G" also stands for God because an unfeigned belief in God is the primary requirement for membership. Agreeable to ancient customs no atheist can become a Freemason, and the letter "G" is placed at the center of the symbol to represent God at the center of one's life. The Lambskin or White Leathern Apron which every Freemason is presented with as an Entered Apprentice is an emblem of innocence and the badge of a Freemason. Its pure and spotless surface is to be an ever present reminder of purity of life and rectitude of conduct, a never ending argument for higher thoughts, for nobler deeds, for greater achievements. The twenty-four inch gauge is used in operative masonry to measure and lay out the work, but speculative Masons are taught to use it for the more noble and glorious purpose of dividing their time. Being divided into twenty-four equal parts it is emblematic of the twenty-four hours of the day, whereby are found eight hours for the service of God, eight for one's usual vocations, and eight for refreshment and sleep. The common gavel is used in operative masonry to break off the corners of rough stones, but in speculative Masonry it is symbolically used to divest one's heart and conscience of all the vices and superfluities of life, thereby fitting the mind as a living stone for that spiritual building, that house not made with hands, eternal in the heavens. The Square, besides teaching us to square our actions with all mankind, is also the emblem of the Master of the Lodge because it is the proper Masonic emblem of his office. Freemasons are taught to, "act upon the square." By this is meant to make virtue the rule and guide of your actions. The level is an instrument made use of by operative masons to lay horizontals, but in specualtive Masonry it serves to remind us that we are traveling upon the level of time. Time, like all things in nature, passes equally for all men. It is neither inclined nor graded in preferrence to any, and the choices we make determine its relative value. And for each and all, time will lead us to that undiscovered country from whose bourne no traveler returns. The Level is the emblem of the Senior Warden of a Lodge. The plumb is an instrument used in operative masonry to raise perpendiculars, but as a Masonic symbol it admonishes us to walk uprightly in our several stations before God and man. It is a reminder to live our lives in a rectitude manner with uprightness; integrity; honesty; justice. The Plumb is the emblem of the Junior Warden of a Lodge. The trowel is an instrument used by operative masons to spread the cement which unites the individual stones of a building into one common mass. As Free and Accepted Masons we symbolically use it to spread the cement of brotherly love and affection; that cement which unites us into one sacred band or society of friends and brothers. There are literally hundreds of symbols and emblems used in Masonry to impart wise and serious truths. Freemason symbols are used as an esoteric language among Masons, for a symbol without understanding is meaningless. It is only through education, explanation and study that understanding arrives. 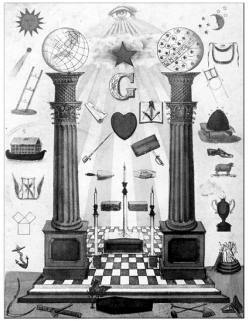 The study of Masonic symbols is a worthwhile endeavor and an extensive field of Masonic education. Hopefully, this page has given you a good idea of how Freemason symbols are used to express to the mind, conscience and heart the moral lessons of faith, hope and charity that Freemasonry teaches. For a more indepth study of Freemason symbols I highly recommend Freemasonry: Symbols, Secrets, Significance by W. Kirk MacNulty and The Freemasons Key - A Study of Masonic Symbolism edited by Michael R. Poll.